Anti Aging Therapies in supervision of Cosmetic Surgeon in case required? Yes! it is possible at Care Well Laser, Skin & Anti-aging clinic in Delhi. It's a perfect Anti Aging Treatment /Therapy center for every age group. Get a rejuvenated skin with the help of some time tested and advanced anti aging treatment/therapies & skin tightening treatment in Delhi, India at our South Delhi Center situated in CR Park. Skin tightening is an effective procedure to improve the overall quality of skin by tightening its elements and structure and developing firmness. Skin tightening can be done through surgical and non-surgical methods. Of these two, non-surgical methods are more popular, because of the array of advantage associated with it. 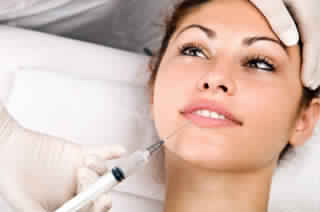 Apart from enhancing skin quality, non surgical procedures also correct skin laxity. Today, renowned plastic surgeons provide non-invasive skin tightening solutions which benefit candidates, in the long run. There are various treatments that deliver nonsurgical skin tightening. The surgeon chooses the best treatment according to the quality of skin and area to be treated. Prior to the procedure, surgeons treat the area with skin and makeup lotions. In certain treatments, thin coat of ultrasound gel is finely applied during the treatment. Based on the device used for the procedure, the targeted area and individual requirements oral or intravenous pain medication are often prescribed to the patients. What are the physical signs of aging? When I should go for anti aging treatment? How long do the cosmetic anti aging last? First of all, with age, skin becomes loose and sages. Since elastic tissues like collagen fibers and elastin reduce, therefore skin loses its firmness and strength. Hence, it droops. Skin loses its smooth appeal and becomes more rough and dry. Aging makes skin fragile and brittle. Aging makes skin weaker than before since epidermis and dermis (layer below the epidermis) come together and flatten the skin area. As one moves towards aging, skin bruises more easily, since it loses support around blood vessels. Beneath the skin's surface in chin, temples, nose, cheeks and around eyes, there is loss of fat which gives a leaner look to the face. Skin therefore appears thinner than before. Loss of bones around mouth and chin causes puckering of mouth. Even nose shapes can change, if it loses cartilage tissues. With age, skin also develops lesions like benign tumors. Such tumors don't affect surrounding skin or spread to other parts of body. It is not a cancer. Skin gains more transparency, with aging. This happens due to thinning of epidermis, the outer surface layer of skin. In 30s or 40s, people develop lines on their facial skin, as a result of expressions they make. These lines can be horizontal on foreheads and small and curved on upper cheeks, temples and around the mouth. Earth's gravity is also responsible for affecting skin. When skin loses its elasticity, gravitation droops the eyelids and eyebrows and creates fullness and looseness under the jaws and cheeks. Ear lobes also lengthen, in advanced ages. There are many cosmetic anti aging treatments available to fight the aging effects. There are endless options when we talk about these treatments some of the top treatments include applying creams, chemical peels and lasers. It is your skin specialist who is going to decide which treatment is better for you. Let us discuss about some of the top cosmetic anti aging treatments. Lasers are used to treat skin that is mainly damaged by sun. When you go for laser treatment, your skin would become supple with less of wrinkles. This treatment is quite accurate and mainly used for areas that are sensitive. They are best for treating areas of eyes. 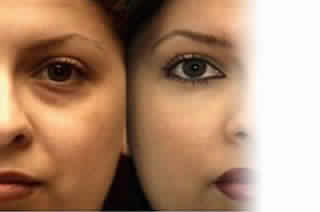 Darker skinned people can experience permanent pigmentation loss. This therapy is also known as natural hormone therapy as well. In this therapy identical hormones with human chemical structure that are produced in the body naturally are used on a molecular level along with endogenous hormones. Bioidentical Hormone Replacement Therapy are opted by women, usually to treat the symptoms related to menopause. 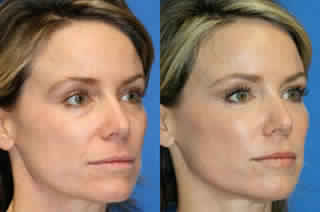 IPL is an effective method for tightening skin in face. It is a 30 minute procedure in which intense pulses of light are used to penetrate deep into the skin tissues. As a result, the collagen and blood vessels lying below the epidermis constricts and reduces redness and age lines. During the process, patients are provided with a protective eye covering. While an infrared light heats the deep dermis (where collagen and blood vessels are present), a handpiece is used to monitor continuous cooling. There is only minimal discomfort and if there is swelling or redness, it disappears soon after the treatment. Patients can see the benefits in few weeks, after the treatment. For better results, patients can also combine radio waves with light waves. Non-surgical ultrasound treatment utilizes the body's own regenerative response for gently and gradually lifting skin under the chin, on the eyebrows and on the neck. The treatment counteracts the effect of time and gravity on skin. In this process, an ultrasound gel is applied to the treated area and a smooth handpiece is placed on the skin. The tissue image is projected on a screen to enable the surgeon view the targeted area. Small thermal bursts are emitted from the ultrasound which stimulates the deep structural support layers of the skin, without causing disturbance to neighboring skin areas. It is a non-invasive procedure which removes lines and wrinkles from the skin and tightens skin layer. Aging is a natural process. The most important sign of aging is the change in skin. You will find dark spots on your skin. These dark spots are called hyper pigmentation. They can be caused by sun damage, inflammation or any other skin injury. Another symptom is sagging of skin. With the passage of time, you may lose or gain weight. This may reduce the tautness of skin and cause sagging. Other symptoms include fine lines, wrinkles, patchy skin and open pores. Individuals who are more conscious about their appearance, personality and health ask this question very often. Based on their knowledge and experience, skin experts including anti aging specialists suggest various ways by which aging can be prevented. Although aging is a natural phenomenon, but if we follow some ground rules, we can lessen the speed of aging. A healthy routine plus taking good care of skin can reduce the aging process. Although you should take care of your skin from the very beginning and follow a healthy lifestyle, but the right time to go for an anti aging skin care treatment is when you find changes in your skin or you have crossed the age of thirty. It is a myth that anti aging treatment is suitable only for people with aging skin or patched skin. Anyone who wants to take good care of skin and want to keep looking younger, brighter and healthy can go for the treatment. Everyone craves for a healthy glowing skin. There are number of ways by which you can take care of your skin and keep looking good. First of all, follow a healthy regime and exercise regularly to keep your skin toned. Wash your skin regularly with clear water to keep away allergens, dust and dirt. Along with that you should use good skincare creams and lotions to keep your skin supple and soft. Skincare specialists always recommend using organic creams and skincare products as they are not harsh on skin and contain herbs and many more natural ingredients. It is also important that you should protect your skin from hot scorching sun. Regular use of sunscreen lotions is very helpful in preventing tanning of skin. Regular visit to your skincare specialist would also help in keeping your skin smooth and moist. You may agree that the food we eat too aid in keeping our skin healthy and supple. Eat healthy food to keep your skin glowing. Consumption of nutrient packed food will add years to your life. These food items will slow down the process of aging. You should take anti-oxidant rich food in your diet. Eat plenty of fruits, vegetables, yogurt, olive oil, fish and nuts in your diet. Drink plenty of water everyday to keep your metabolism good. Eating healthy will keep metabolism good and slow down the process of aging. There are as such no serious side effects of cosmetic anti aging treatment if you are getting the treatment done from an expert. Whenever you will go to skin expert for an ant aging treatment, they would do a patch test to ensure that you are not allergic to that treatment. Yes, there can be some temporary effects such as redness of skin, swelling, bruising or even pain. Your skin expert would guide you take care of the temporary issues that may arise. With passage of time, these side effects would go away making you look young and smart. 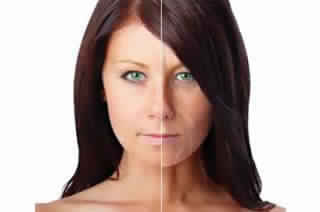 Maximum cosmetic anti aging treatments give permanent results. If they are performed by an expert who has profound knowledge and experience in the field of anti aging treatments, you can be rest assured that you will have good results for longer duration. Hopefully, the above information is quite valuable for a person who wants to go for an anti aging treatment. If you too are interested for this treatment, make sure that you consult an expert to do the job for you. Call us or visit Care Well Medi Hub (South Delhi, CR Park) for the best anti aging treatment that will suit you.